A small box with huge sonic potential - possibly all the modulation effects you'll ever need. Programmability. Huge range of classy sounds. Informative display. It's complex so there's a lot to learn. A staple of professional studios as well as finding their way into the rigs of many top guitarists, Eventide processors have never been the first choice for the budget-conscious. There are also many guitar players who would not entertain the thought of onstage rack-mounted gear, so the introduction last year of the company's processing in affordable stompbox form was very welcome. Powered by the supplied 9V adaptor and operable in mono or stereo, the ModFactor is well put together and at 122mm x 190mm takes up less pedalboard space than some units that only do a fraction of what it can do. 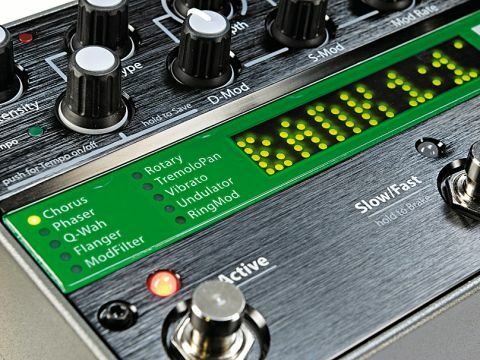 The ModFactor has 10 distinct modulation effects - chorus, phaser, Q-wah, flanger, ModFilter, rotary, TremoloPan, vibrato, Undulator and RingMod. These can be chosen using a rotary switch while a further knob selects up to four types of effect in each category. There are four phaser types, four flangers and three each of chorus, ModFilter and vibrato, while each of the other categories has two types each. "A ModFactor fully programmed with your own sounds ready for instant recall will increase your pedalboard's versatility no end." A array of nine further knobs is available to tweak the sounds. Most of these have the same function whatever category of effect is selected while the Intensity and Xnob always control something specific to a particular effect. The parameter for any knob being tweaked shows up in the display instantly so you always know where you are. The ModFactor has 40 onboard user presets in 20 banks of two, which should be plenty to save all of your favourite effects. Three footswitches give instant control to the ModFactor but these have different functions depending on the mode you are in. In 'Play' mode the first footswitch turns the effect on and off while the second switches between slow and fast speeds as well as acting as a braking effect that slows down the modulation rate as long as it is held down. The third switch is for tap tempo but holding it down changes modes calling up 'Bank' mode introducing access to the presets. In this mode the third switch calls up the 20 banks sequentially while the other two switches select each of the presets in the bank. A large number of controls are pretty much a necessity when building the sort of versatility you'd get in a rackmount processor into a pedal, and that makes the ModFactor much more complicated than an average stompbox - just starting out in 'Play' mode. With the detailed manual as a guide, though, and starting by tweaking the factory presets, you can get the measure of the unit and unlock the massive sonic potential within. The 40 presets are initially filled with factory-programmed sounds. The versatility stacks up even further by adding an expression pedal for real-time control over any combination of eight parameters. Always classy, the sounds range from Fender and Vox-style amp tremolo through many chorus, flanger and phaser variations to more esoteric stuff like metallic ring modulation and 'Undulator' which, using combined delay, detuning and tremolo, can create a unique soundscape. The ModFactor will do all the standard modulation sounds but it can take them all further so is a great tool for creating something different for the studio or stage. A ModFactor fully programmed with your own sounds ready for instant recall will increase your pedalboard's versatility no end.